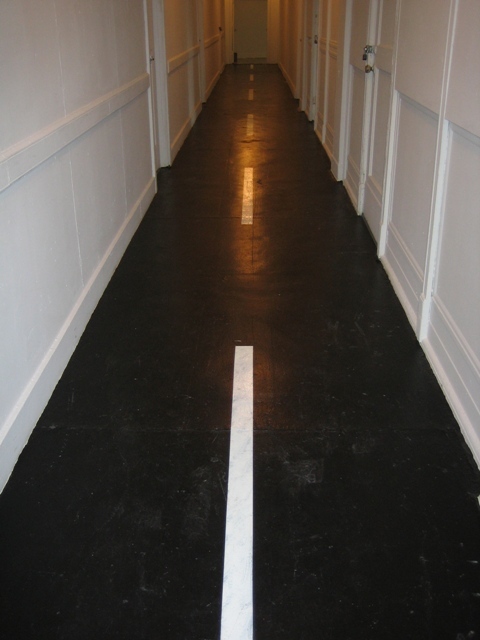 In Two Lane Blacktop, Mary Heilmann brings her trademark wit to the Clocktower Gallery by painting white lines down its slim, black floor, effectively turning the corridor into a passageway of a different sort: a displaced highway. Beneath Oursler’s disorienting lights, Heilmann offers the viewer order, as if, through her clearly demarcated lines which lead to AIR’s pristine Performance Gallery, to prevent logjam or encourage traversal. Mary Heilmann's Two Lane Blacktop. Courtesy: AIR, Art International Radio and the Clocktower Gallery, 2009.